Clockwise from left: Reuben, Weisswurst, Potato Pancakes and Grilled Cheese at District 9 Draught Haus. It’s exciting to see poorly-used centers get revitalized and become neighborhood destinations instead of sad empty eyesores. It started a few years ago at the intersection of Garland and Peavy with Goodfriend, 20 Feet and now Hello Dumpling and GAPC. Now White Rock Center at the corner of Lake Highlands and Buckner is undergoing a similar transformation. El Vecino and Le Caveau joined the long-standing Green Spot there, and now District 9 Draught Haus has opened its doors in the center, providing yet another beer-centric hangout along the lines of Goodfriend (but with better parking) and White Rock Alehouse & Brewery (but with a smaller and more focused menu). 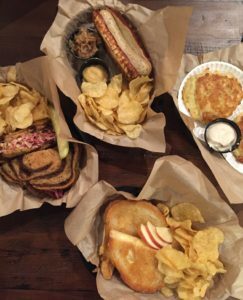 The majority of the small menu is made up of sandwiches, ranging from sausage on a pretzel bun to a Rueben or a Portobello sandwich with vegan aioli. There are also a couple of sides, a charcuterie board and a couple of desserts as well, if you need sweets with your beer. I’ve said it before, but I think it bears repeating: I’d rather see a menu with 10 well-prepared options than a large menu with lots of hits and misses. We tried a few of the sandwiches on a recent visit and the only issue we found was deciding which one we liked better. The weisswurst is exactly what you might expect, a mildly-flavored pork sausage with not a ton of character. But there are herbs in the sausage that add a little color and it’s served on a beautifully crisp and chewy pretzel bun that puts the more commonly found sad, rubbery pretzel buns to shame. From the perfectly griddled marble rye to the tender, salty corned beef, it’s messy and satisfying, just as a good Rueben should be. Potato pancakes are not like the latkes you might expect; in fact, they are unlike any potato pancakes I’ve ever tried. More like a soft pancake with potatoes added than a crispy disc of shredded potatoes, they are the owner’s mother’s recipe. The atmosphere is friendly and, at times, can be a little harried, but the crowd always seems to be in good spirits. The staff sometimes comes across as a little bewildered by the crowds of people who have flocked to their little place, but I’ve not felt unwelcome. We’ve already witnessed at least two birthday parties taking place, so it’s clearly already a few locals’ go-to place. I foresee spending a few celebrations of my own there in the near future.